Despite folklore to the contrary, there are no simple guidelines which will separate edible wild mushrooms from inedible species. You must assume the responsibility to identify all wild mushrooms you collect to eat with 100 percent accuracy. Many edible species have toxic look-alikes; learn what these are, and do not rely only on one photograph or drawing! Always do your research and this includes investing money in well-researched mushroom identification books. Never rely solely on the Internet. Emergency department physicians across the U.S. and Canada have increasingly had to treat mushroom poisoning. Interest in eating wild mushrooms has risen dramatically in recent years. In addition, some people are seeking certain mushrooms for their hallucinogenic component, which also has detrimental consequences. In late 2016, fourteen people in northern California became terribly ill after eating Amanita phalloides, otherwise known as the “death cap”. Thankfully no one from this group lost their life but three individuals (including an 18 month old) needed liver transplants. In British Columbia the B.C. Drug and Poison Information Centre received an increase of calls regarding poisonous mushrooms according to their 2016 statistics. Experts recognize Amanita phalloides as the deadliest mushroom because it is the cause for an estimated 90 per cent of fatal mushroom poisonings worldwide. Death caps are not the only toxic mushrooms to avoid. Depending on the species, the adverse effects range from mild gastrointestinal symptoms to major cytotoxic effects resulting in organ failure and death. Toxicity can vary depending on the quantity and age of the mushroom, the season, the geographic location and the way in which the mushroom was stored and/or prepared prior to ingestion. Despite folklore to the contrary, there are no simple guidelines which will separate edible wild mushrooms from inedible species. You must assume the responsibility to identify all wild mushrooms you collect to eat with 100 percent accuracy. Many edible species have toxic look-alikes; learn what these are, and do not rely only on one photograph or drawing! Always do your research and this includes investing money in well-researched mushroom identification books. Never rely solely on the Internet. Bottom line, if you have any doubts at all about a mushroom you are trying to identify – throw it out! When trying a mushroom species for the first time that you have identified with 100 confidence, eat only two cooked teaspoons of one species, and wait at least 24 hours before eating any more of that species or trying another new species. Some people may have an allergy to one particular mushroom species, just as some people are allergic to other foods. If you are eating new species for the first time, and you eat more than one species and have a reaction you won’t know which species you are allergic to. So sample new species one at a time (one per day maximum), and for the first sample, limit to two teaspoons. Always cook mushrooms – never eat raw! Always keep a whole, uncooked sample of the mushroom species in your refrigerator. If you made an error in identification and need medical help having a mushroom to take to the hospital with you can help medical professionals treat you. Do not consume alcohol when trying a mushroom for the first time. Wait until you are sure you are not allergic to a particular species before having it with wine or beer. When consuming a new mushroom species, the presence of alcohol may produce stronger allergic reactions. 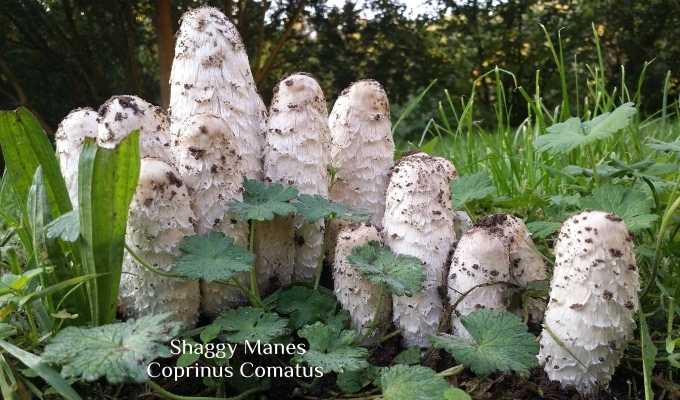 In addition, one species of the genus Coprinus reacts with alcohol resulting in very uncomfortable symptoms. You wouldn’t eat moldy or rotting produce from the grocery store the same rule applies for wild mushrooms (or edible wild plants). Be aware of where you are collecting your edibles. Mushrooms can readily pick up chemicals from the environment. Never consume edible species from a lawn where fertilizers or pesticides might have been applied. Avoid collecting along busy roads or anywhere near old dump sites. Do not eat fungi growing on ornamental trees. In some cases, toxins in the wood may be incorporated into the fungal tissue. If you go out on your own, have someone who has mushroom identification experience double check your mushrooms before you eat any. Only harvest mushrooms that are fully formed. Many mushrooms in their immature or button state can easily be easily confused with other mushrooms. Learning how to properly identify mushrooms includes knowing how to identify trees. Some mushrooms only fruit on or near specific trees or plants. It is highly advisable to know tree types (hardwood or conifer) and specific species of trees (e.g. Douglas fir, birch, blue spruce, alder, etc.) and plants. Start with mushrooms that are the easiest to identify – those that are unique with no look-alikes that are toxic. Mushrooms on my website have only these types of mushrooms. Some of these include chicken of the woods, the lobster mushroom, tinder conk, common morel and more. Spore colour (this requires making a spore print). For a newbie, this may sound like a time consuming and onerous process; and yes, it is. In fact it may take two or more years before you gain the knowledge to safely forage for mushrooms. It is difficult to know exactly how many people get sick after eating wild mushrooms in Canada (probably the U.S. as well). Statistics from the Ontario Poison Centre show Ontario and Manitoba received about 200 calls for possible mushroom poisonings in 2014 – and those 200 calls could have been avoided if those people took the time to properly identify the mushrooms they ate. To better familiarize yourself with mushroom terminology the fun way be sure to check out the All About Mushroom activity sheet in the freebie section on the website! Your Autumn Mushroom pdf is a great resource. I think everyone should have this if they hunt for mushrooms. Thank you so much! I am so glad you are enjoying it!